Our expertise team working in the industry since 5 decades now we a well known name in providing the best solution to the problem related to rubber lining works. We also provide rubber Lined Pipe works. We are able to do the fabrication works in pipe, Tank, Vessel and other articles of any metal and provide Rubber Lining works for the safety from material like water, oil, chemical and other liquid. Hence we are capable to solve every problem related to rubber lining works. Vijay Rubber Works are working in the industry since 1968. Our offered service of rubber lining works is offered to the different industries like chemical, pharma, oil & Gas, Industrial Valves etc. We also provide Rubber Lining works to the product like Roter. Vijay Rubber Works are a well known manufacturer and supplier of Rubber product. We offer wide range of rubber & Teflon product. Our product Expansion Joint is developed using high grade of raw material by our technical team having good experience in the industry. Our team is having high tech workshop fully equipped with all necessary equipments. These Rubber Expansion Bellows are used as a discharge size of heavy application in pumps. Same like other products we manufacture these Rubber Expansion Joint are manufactured as per the specification and designs provided by our esteemed customers. We offer a complete solution for Vessel Rubber Lining works. As Rubber is having good elasticity, good resistance to chemical & Oil. Our Services for Rubber Lining work is required to prevent the corrosion, Erosion, Abrasion from substances like water, Oil, chemical, and other hazardous material. Also it is used to absorb and prevent sound pollution and vibration. Rubber Lining works internal & External offered by us to various industries and products like Pipe, Tank, Vessel, Butterfly Valves etc. Both Internal & External rubber lining works done by us using hi tech technology. We provide site visit and consulting facility so that we can offer our client the best solution for their problem. We provide a complete solution of all type of Rubber Lining Works. We cater the industry line Chemical, Cement, Pharma & Power Plant. We are running our company with the team of professional. We provide the Rubber Lining services to the product like Tank, Vessel, Pipes etc. Our Expertise is into provide solution to all problems after consulting and visit to the site. We are manufacturer of a complete range of rubber product. Our offer product range like Rubber Gasket, Rubber Ring, Grommet, Rubber Pressure Cup, Metal Inserted Neck Ring etc. are used as a part in pump industry. These products are manufactured using high grade of raw material. Features :. Long Lasting products. High Grade Raw material. Highly Durable. We are prominent manufacturer and supplier of all type of Rubber & Teflon coated diaphragm widely used in Saunders type valve, Gas type valve, Pneumatic & Actuators. We specialize on developing all these product according to the requirement of our customers. We are also having expertise in developing leather diaphragm used in stone crusher machine. Rubber Dam Seal is a rubber product and these product is specialized in absorbing sound and vibration. We manufactured these product in musical type and it is used for sealing the dam gate. Same like other product it is completely possible for us to design it as per the requirement of our customer. We are manufacturer of all kind of Rubber product and Rubber Lining Works. 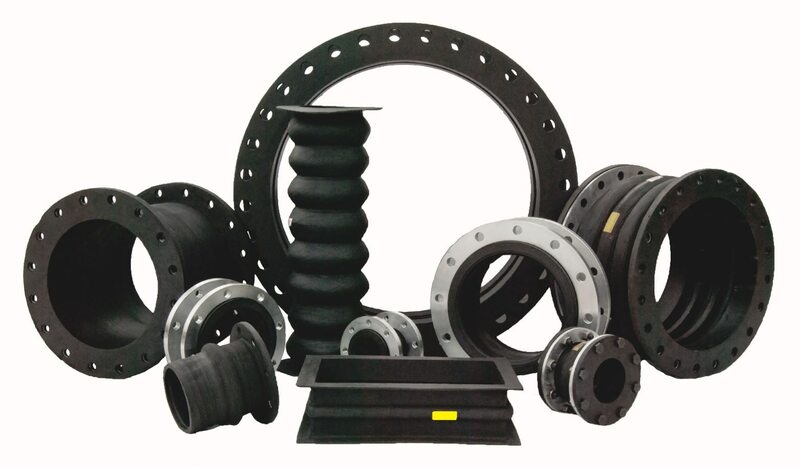 We are working in the industry since many decades, and now we have an expertise in manufacturing Rubber Expansion Joint with Bellows. These product is used for high pressure pump line and dust cover which are molded & fabricated. These product is very unique in quality and is available with very competitive price range.